As much as we adore creating things that are pretty and fun to look at, we find that it’s nice every once in a while to create something that we might actually use! 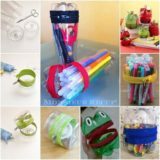 After all, the more experience you get in your basic crafting and DIY skills, the more useful you’ll find those skills when it comes to making yourself things that you actually need in every day life. We’re grateful for our DIY abilities because sometimes they save us from going to the store for basic household things that we can save money on by making ourselves. The real fun of it, however, comes in being able to make yourself fun things in custom patterns, styles, and colours just because you can! 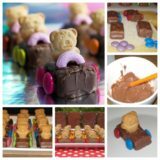 So, what’s the most recent household item we saved ourselves a trip to the store for by making it at home instead? 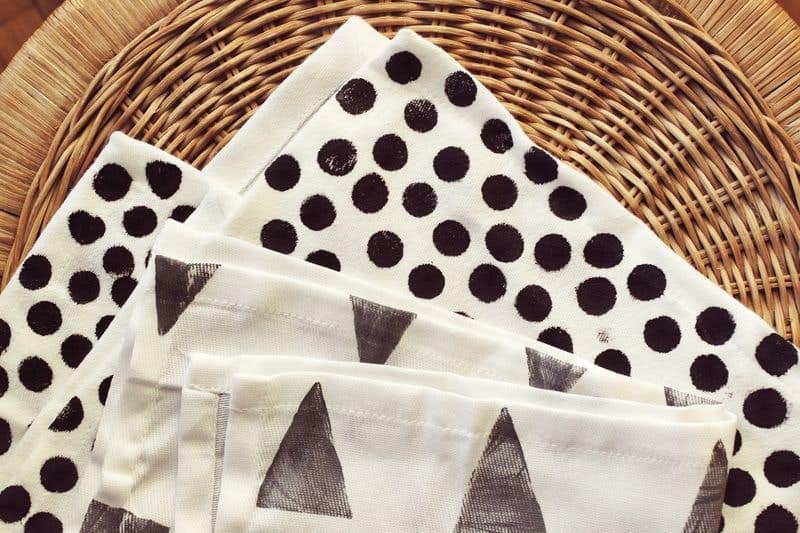 Well, it was a much simpler thing than you might think; we recently made ourselves napkins! 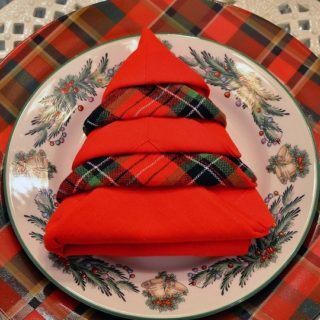 Check out these 15 awesome homemade napkin patterns and ideas that are way easier to make than you might think and totally useful! 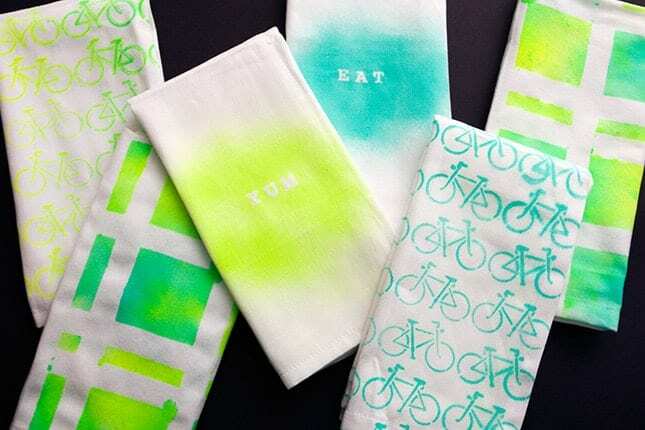 Do you love the idea of making custom napkins because you’re obsessed with bright colours and you’d really like more eye catching options than what you usually see in the store? Well that’s definitely somethin you can make happen, but what if you want to add certain details, like borders and edging, even if you can’t sew? Don’t worry! 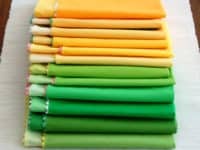 That’s why this tutorial from Purl Soho is here with some great no-sew instructions that will help you not only create bright napkins but also add adorable little coloured scalloping around the edges. Okay, so we know we’re actually in the middle of summer right now, but don’t you ever craft for a season or holiday well in advance so that you actually have the pieces ready to go when it’s actually time? We sure do! 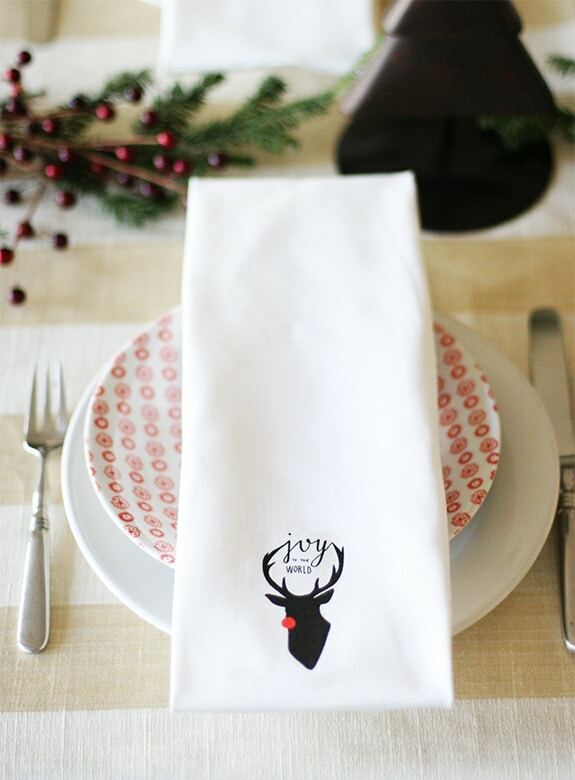 Maybe we’re just overly organized, but we love these adorable little Rudolph silhouette napkins that we’re putting them on our list anyways. Say Yes shows you how to transfer the simple reindeer image onto a plain napkin in order to give it some custom detail. 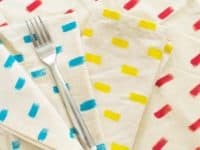 The beauty of making something as simple as a napkin, which is essentially a large fabric rectangle or square, is that it’s plain enough for you to use really bright colours and crazy patterns without overwhelming anyone. 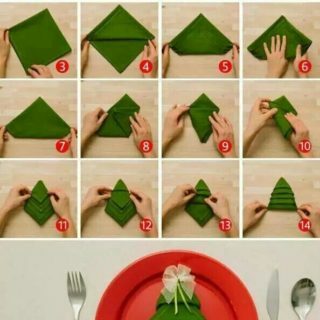 That’s why we like this simple, down to earth cloth napkin tutorial from Green Wake. 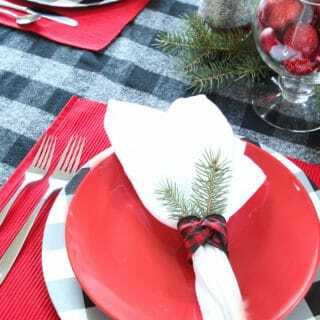 They show you how to make the basic, everyday dinner table napkin, taking great care to make sure that you know how to make a nice, neat edge so your napkins look great when you set the dinner table, even though they’re not store bought. 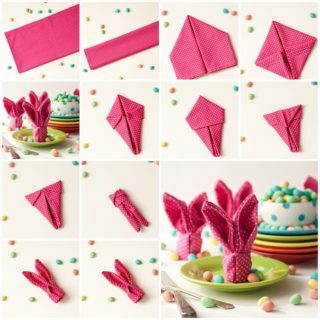 Since we are in the middle of summer right now, would you prefer to make yourself a cheerful, sunny napkin design that you could set on the table tomorrow at your family’s picnic reunion afternoon and have them totally suit the weather and the day? 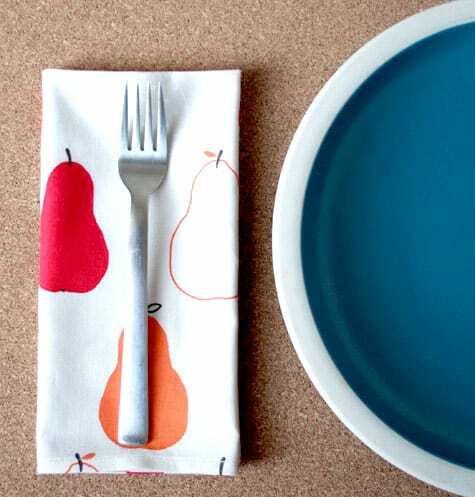 In that case, check out how Design Sponge made these simple napkins celebrating summer fruit! 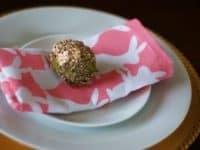 They chose to use fabric that’s covered in pears, but you could make your napkins from any fun fruit or berry design you choose. If there’s one thing that’s always made us melt when it comes to detailing and embellishment, no matter what kind of project we’re talking about, it’s lace. There’s just something about lace that really holds our hearts! 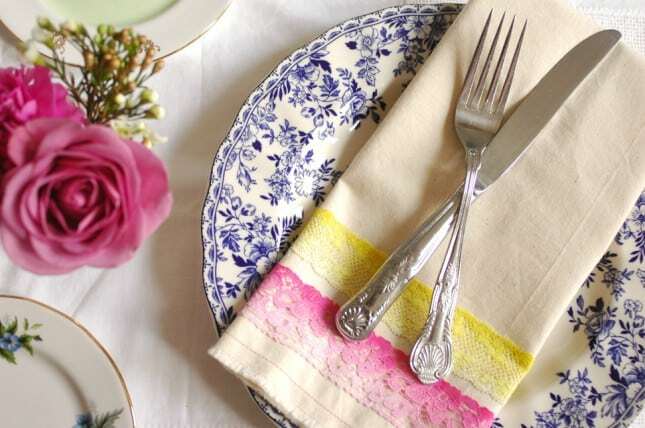 Even for a simple household item like a napkin, a pretty lace trim looks fantastic, especially if you create a subtle colour ombre on each piece of the trim like AO Life did here. 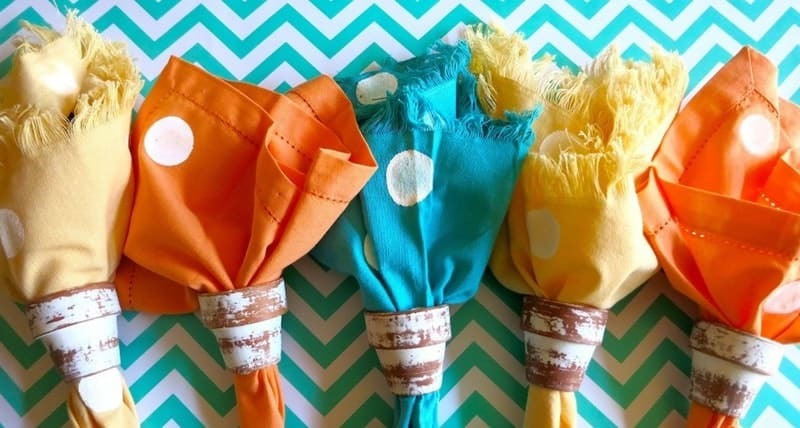 We think these are so lovely that we’d hardly want to wipe our hands on them! 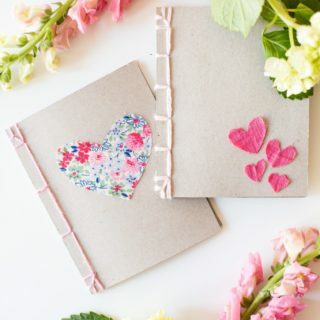 If you’ve never created your own DIY stamps then you’ve been missing out! 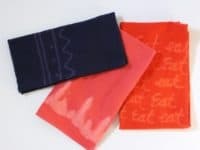 Similarly, if you’ve never done fabric stamping, whether your stamp is homemade or not, then we really think you should try your hand at it, because it’s honestly a great time! 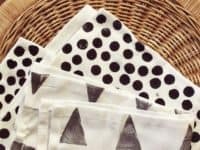 Beautiful Mess thinks so too, so they suggest making yourself a set of DIY napkins by taking plain white fabric (though a plain solid colour would work too) and stamping it with simple shapes like triangles or polka dots. They chose regular black fabric paint to stamp their napkins, but we think a bright contrast colour could look very cool as well! 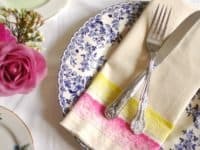 We talked a little bit about ombre techniques above, but are you absolutely obsessed with that aesthetic and looking to make it a much more central element of your napkin set than what you saw in the project above? 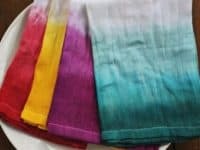 Then you’re going to love these adorable ombre dyed fabric napkins from Flor! 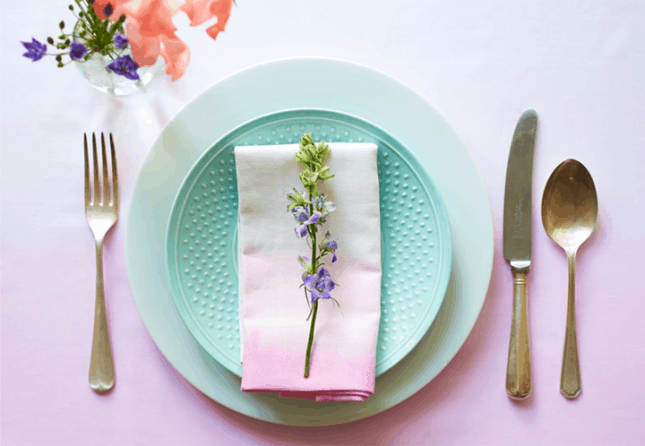 We love that there’s no denying their awesome colour fade but, at the same time, the shade is subtle enough that it won’t clash with the rest of your tablescape. 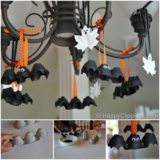 Speaking of seasonal crafting in advance, why not prepare for Easter while you’re preparing for Christmas? 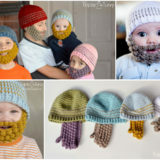 Okay, we know it might be a little bit early for that, but that doesn’t mean you can’t file this idea away until later! 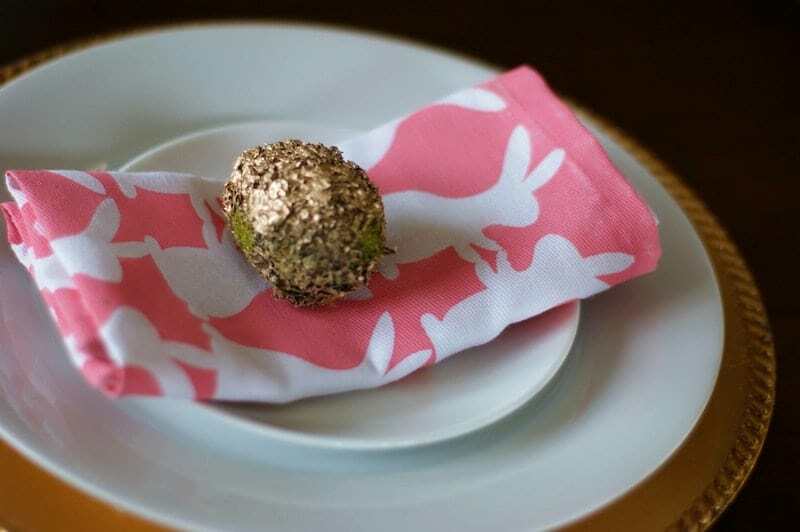 Mattawa Mum suggests making Easter dinner napkins that have bunnies on them or, more specifically, little white silhouetted outlines of bunnies! 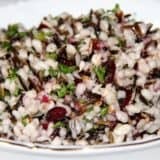 These shapes keep the look kind of minimalist, making them easier to match the rest of the table accessories, like the table cloth, with. 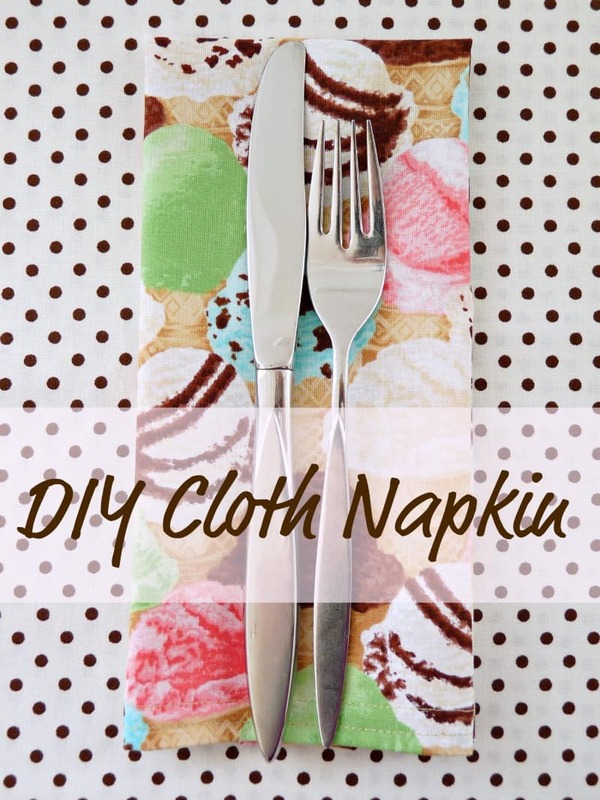 Besides giving you an awesome suggestion for print and pattern, this DIY napkin sewing tutorial from Dans Le Lakehouse also teaches you an awesome and totally useful new skill! 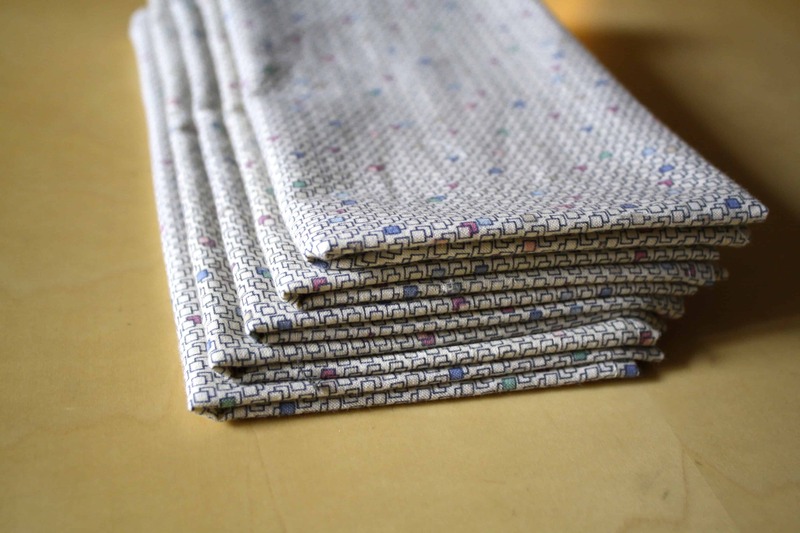 By making mitred corners, you’re giving your napkin a bit of extra finish that not only makes the edges look very neat, but also makes the napkins more durable when you use and wash them! 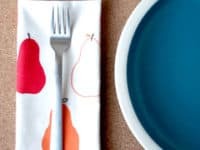 Perhaps you were a huge fan of the ombre dyed napkin idea, but you really do want the full effect of the brightly coloured dye on your dinner table, rather than the lighter pastel look? 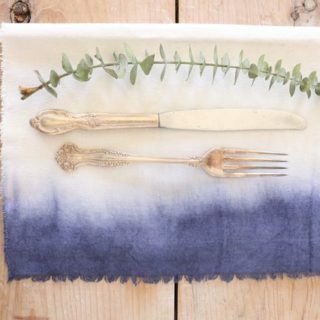 Then we have a feeling you’ll love A Beautiful Mess‘s idea for making a whole set of napkins that are dyed in different but complementary jewel tones. 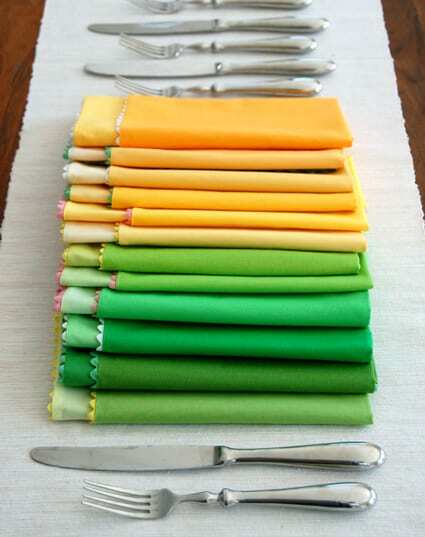 Just imagine how bright and cheerful your tabletop will look each time you lay them out for dinner! Okay, we know we just told you about neat edges and finished corners, but what if you wanted a more unfinished, chicly distressed look across your dinner table décor because it’ll match the rest of your rustic chic home? 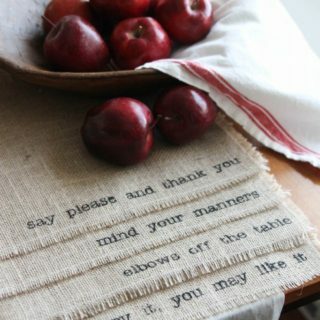 In that case, you’re going to love these frayed edge napkins from 2 Bees in a Pod! They look like the kind of think you’d find on a fairy tale picnic; well loved and slightly used looking, but bright and cheerful nonetheless. If you’ve already tried bleach art and designs before, then you already know what an awesome treat you’re in for with this project! 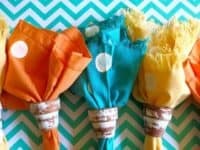 The Whimsey Box suggest buying or making plain, solidly coloured napkins and carefully using bleach to create patterns, designs, or words on the fabric before letting them sit and soak. 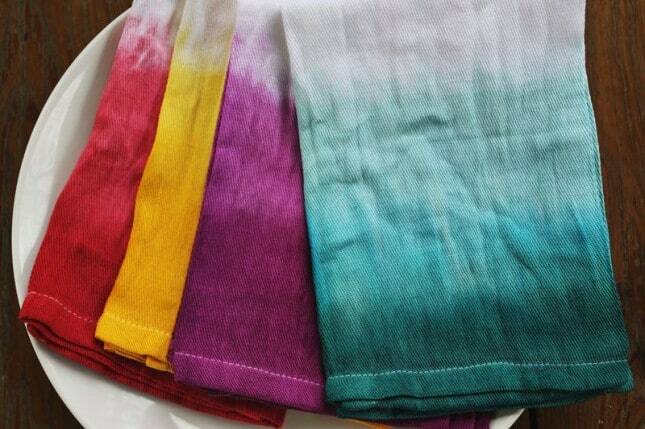 Once you’ve washed and dried the napkins, you’ll see that the bleach has removed colour in the shape you drew! 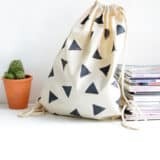 Just be sure to be very careful while you make these because bleach will also take the colour out of the clothes you’re wearing and the things around you while you craft too. 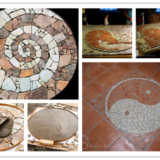 No matter what the project or theme is, some of our very DIY projects are the ones that are recreations of more expensive brand name items that we just can’t shell out the money for right now. 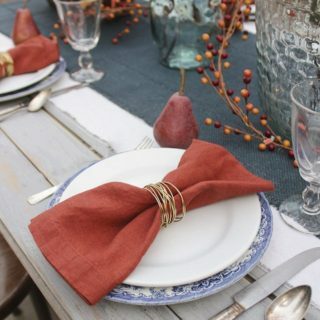 Believe it or not, there are brand name pieces and prices for everything, right down to the napkins on your dinner table! 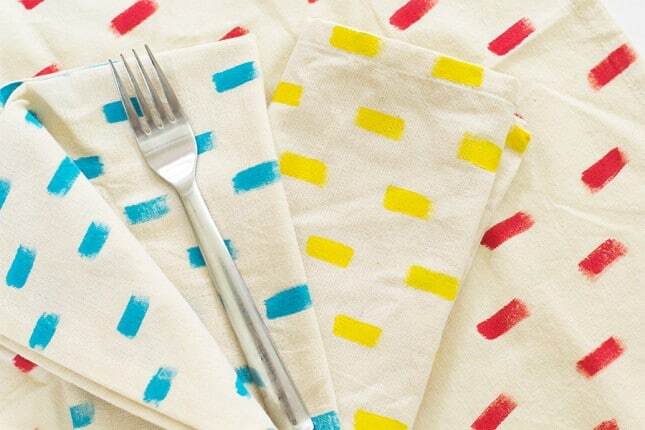 That’s why we thought these primary colour painted napkins from Sarah Hearts were such a cool idea. 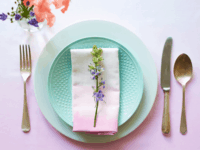 They’re actually a dupe of the original napkins designed by Anthropologie, but they’ll cost you a lot less to make yourself than they would to buy the real thing. 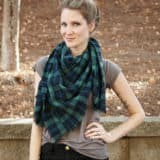 If you’ve ever crafted with a permanent marker or Sharpie pen and gotten the in on your clothes or something sitting near you while you worked, then you already know that they’re not kidding about the “permanent” part. 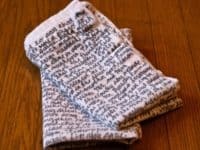 We’ve ruined countless fabric made things because we were careless while we were using Sharpies and stained the material. In this case, however, you’ll find one of the rare occasions where that’s exactly what you want! 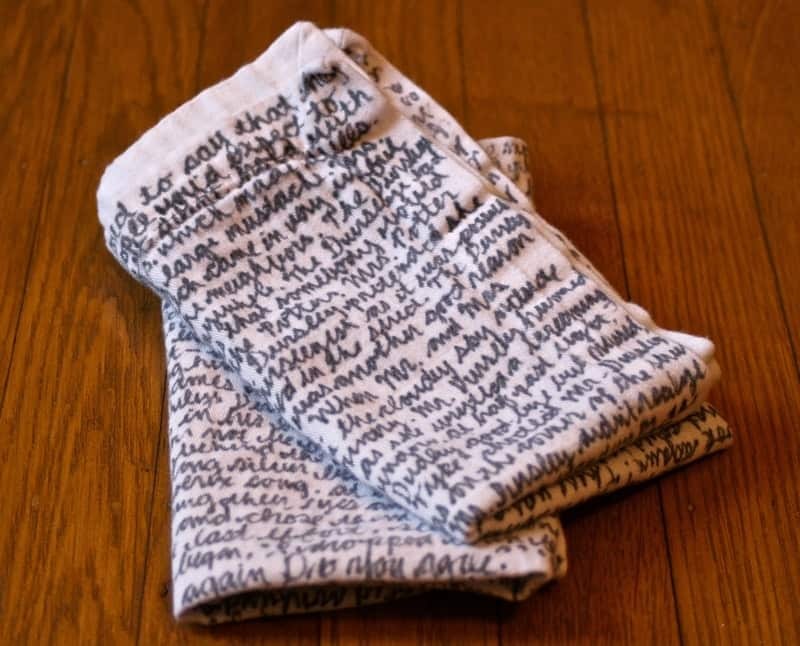 The Surznick Common Room guides you through the process of making quote napkins that feature neatly written words all across the surface, like song lyrics or passages from your favourite books. 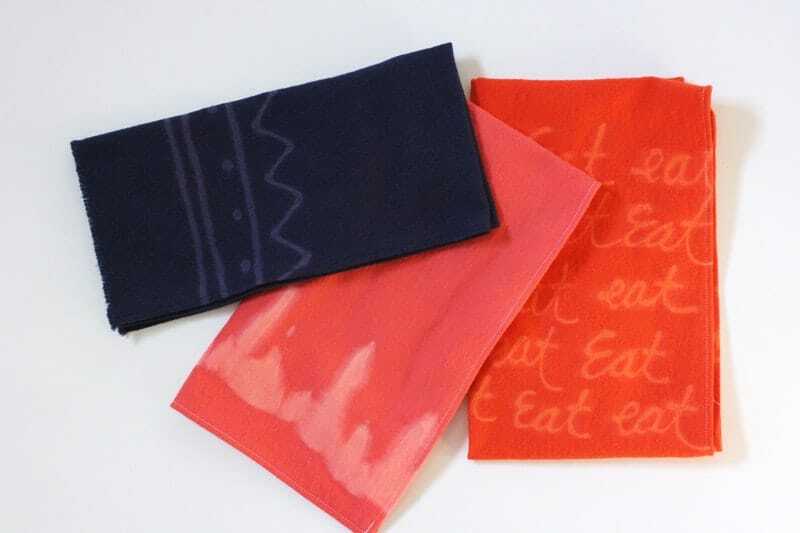 Because the ink is permanent, you’ll be able to wash the napkins after they’ve been used without ruining them! 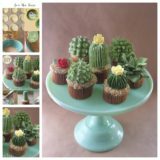 Are your personal and décor styles a little bit brighter than the average person and you really want your guests to be able to see that when you have them over for dinner? In that case, neon spray fabric paints and cool graphic stencils are about to become your best friends! 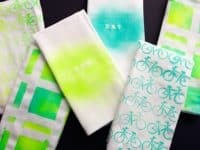 Brit + Co. shows you step by step how they created these totally awesome napkin patterns by layering sprayed colours across strategically positioned stencils to get a bright, eye catching look that’s totally custom to you and what you like.